After a last-minute Air Force computer glitch that threatened to derail launch, the shuttle Discovery, carrying an all-veteran crew of six, critical supplies and a final U.S. module for the International Space Station, blasted off with seconds to spare and vaulted into orbit Thursday to begin its 39th and final flight. Flight controllers in Houston have bid goodnight to commander Steve Lindsey and crew. After successfully getting into orbit, the astronauts quickly went to work transferring their rocket into a spacecraft by opening the payload bay doors and activating the myriad of systems. They've already completed the first in the series of trajectory maneuvers en route to the space station. The shuttle's robotic arm also got checked out to prepare for tomorrow's standard post-launch heat shield inspections. The astronauts heading to bed for an eight-hour sleep period. They'll be awakened for Flight Day 2 at 6:50 a.m. EST. The latest version of the NASA Television schedule (Rev. B) can be downloaded here. The robotics checkout is progressing well with no problems to report, Mission Control says. The astronauts have powered up and extended space shuttle Discovery's robotic arm for a system checkout. Space shuttle Discovery and crew have completed NC1 engine firing to adjust the orbital path to the International Space Station. The ascent team of flight controllers led by Richard Jones is handing over to the Orbit 2 team and flight director Ginger Kerrick to oversee the rest of the astronauts' workday. The CAPCOM duties will be handed from Charlie Hobaugh to Megan McArthur. T+plus 129 minutes. The Ku-band system has been activated successfully. You may remember that the Discovery previous mission last April ran into a hardware failure and were unable to use the Ku-band for communications or rendezvous radar. T+plus 117 minutes. The Ku-band antenna is deployed. This is the system used for high-speed communications, television downlink and the rendezvous radar. T+plus 110 minutes. Discovery's antenna for Ku-band high-speed communications is being deployed. Standing by for system activation. T+plus 101 minutes. The protective doors covering the star trackers on the nose of Discovery are being opened. The devices are used as part of the spacecraft's navigational systems. T+plus 98 minutes. Go for on-orbit operations! That's the formal call from Mission Control indicating the shuttle is in good shape following launch and the Discovery crew can proceed with mission activities. "Great! Go for orbit ops!" commander Steve Lindsey replied. 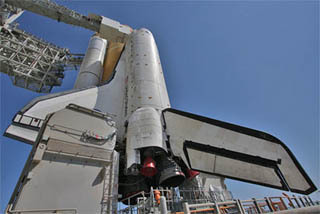 Both 60-foot-long payload bay doors of shuttle Discovery have been opened and the radiators activated. Over the next few hours, the astronauts will busily begin setting up the onboard computer network and downlinking imagery and data gathered during ascent. The crew will be getting out of their launch and entry spacesuits, stowing away the mission specialists' seats and getting some dinner as well. An eight-hour sleep period begins at 10:50 p.m. EST. T+plus 92 minutes. The radiator preparatory steps have been performed and the payload bay doors are being opened. T+plus 86 minutes. The post-launch news conference is underway at Kennedy Space Center. Some foam losses were seen in the external tank video camera footage during launch. Analysts will look at that, but there's no cause for concern for Discovery because the events occurred after the aerodynamic sensitive time period when damage can occur. T+plus 73 minutes. Mission Control has voiced a "go" to the crew for payload bay door opening. T+plus 60 minutes. The crew continues working through its post-launch activities. The next big milestones will be opening up the payload bay doors and deploying the Ku-band communications antenna. T+plus 50 minutes. Discovery is 121 miles over the Indian Ocean now. T+plus 39 minutes, 49 seconds. The twin Orbital Maneuvering System engines on the tail of Discovery have been fired successfully to propel the shuttle the rest of the way to orbit. T+plus 37 minutes, 43 seconds. Ignition of the OMS engines has been confirmed. This will change Discovery's speed by 65 mph. T+plus 37 minutes. Discovery in the proper orientation for the upcoming maneuvering burn to raise the orbit toward the International Space Station. This will be a 1-minute, 3-second firing resulting in an orbit of 141 by 98 statute miles. T+plus 32 minutes. Commander Steve Lindsey and pilot Eric Boe are getting Discovery maneuvered into the proper position for the OMS 2 engine burn to boost the shuttle from its current orbit of 136 by 36 mile statute miles. T+plus 20 minutes. The planned OMS 2 burn will begin at T+plus 38 minutes, 30 seconds. T+plus 16 minutes. Discovery now cruising over the North Atlantic. T+plus 15 minutes. The three Auxiliary Power Units are being shut down by pilot Eric Boe. T+plus 10 minutes. Discovery has safely arrived in space after her 39th and final launch, setting sail for an 11-day voyage to deliver a bonus module for storing equipment and an external spare parts deck onto the International Space Station. T+plus 9 minutes, 30 seconds. It was a nominal MECO. A quick boost from the Orbital Maneuvering System engines is not required to reach the planned preliminary sub-orbital trajectory. T+plus 9 minutes, 15 seconds. Still cameras embedded in Discovery's umbilical well are taking images of the external tank to document its foam. T+plus 8 minutes, 50 seconds. The emptied external tank has been jettisoned from the belly of space shuttle Discovery. The tank will fall back into the atmosphere where it will burn up harmlessly. T+plus 8 minutes, 32 seconds. MECO. Main Engine Cutoff confirmed! T+plus 7 minutes, 40 seconds. The main engines are beginning to throttle down to ensure the shuttle does not experience forces greater than 3 g's as it continues to accelerate prior to engine shutdown. T+plus 7 minutes, 15 seconds. Single engine press. The shuttle can reach orbit on the power from a single main engine should two fail at this point. But all three continue to fire properly. T+plus 6 minutes, 40 seconds. "Press to MECO." Discovery can now achieve a safe orbit on two engines. All three remain in good shape. T+plus 6 minutes, 35 seconds. Discovery is 67 miles in altitude, 447 miles downrange from the launch pad, traveling at 9,800 mph. T+plus 6 minutes. The shuttle has started rolling to a heads-up position to improve communications with the TDRS satellite network. T+plus 5 minutes, 25 seconds. "Press to ATO". Discovery can reach an orbit, albeit a low orbit, on two engines should one shut down now. But all three powerplants are still running just fine. T+plus 4 minutes, 55 seconds. Discovery is 66 miles in altitude, 229 miles downrange from the launch pad, traveling at 6,200 mph. T+plus 4 minutes, 40 seconds. Discovery will be tripling its speed in the next four minutes to reach orbital velocity of nearly 17,500 mph. T+plus 4 minutes, 20 seconds. Discovery is 62 miles in altitude, 170 miles downrange from the launch pad, traveling over 5,000 mph. T+plus 4 minutes. Negative return. The shuttle has passed the point where Discovery could turn around and make an emergency landing at Kennedy Space Center in the event of a main engine problem. Landing sites in France and Spain are now available to Discovery in the unlikely event an abort occurs during the remainder of today's launch. T+plus 3 minutes. Overseeing today's climb to orbit from the Mission Control Center is ascent flight director Richard Jones. Seated alongside in Houston in direct radio contact with the crew is CAPCOM astronaut Charlie Hobaugh. T+plus 2 minutes, 45 seconds. Commander Steve Lindsey just received the "Two-engine TAL" call from CAPCOM Charlie Hobaugh in Mission Control. The call means Discovery can now reach a Transatlantic Abort Landing site if one main engine fails. However, all three engines continue to burn normally. T+plus 2 minutes, 35 seconds. The Orbital Maneuvering System engines have been ignited for an additional kick of thrust during Discovery's climb uphill. T+plus 2 minutes, 34 seconds. Discovery is 37 miles in altitude, 53 miles downrange from the launch pad, traveling at 3,189 mph. T+plus 2 minutes, 20 seconds. Guidance is converging as programmed. Discovery's engine nozzles are swiveling to steer the ship toward a precise point for main engine cutoff about six minutes from now. T+plus 2 minutes, 10 seconds. Mission Control confirms a good jettison of the solid rocket boosters has occurred. The spent boosters will parachute into the Atlantic Ocean for retrieval. Discovery continues its streak toward space on the power generated by the three liquid-fueled main engines. T+plus 90 seconds. The space shuttle now weighs just half of what it did at liftoff. The solid rocket boosters are burning 11,000 pounds of propellant every second. The main engines are guzzling a half-ton of liquid fuel per second from the external tank. T+plus 70 seconds. Discovery's three main engines have revved back up to their 104 percent power setting. And Mission Control has given the "go at throttle up" call. T+plus 60 seconds. The Discovery is flying heads-down, wings-level on a northeasterly trajectory away from the Florida spaceport on its last space voyage. T+plus 40 seconds. Discovery's three liquid-fueled main engines are throttling down to their 72 percent power setting to ease the strain on the vehicle during passage through the region of maximum aerodynamic stresses. T+plus 20 seconds. The roll maneuver is complete, placing Discovery on the proper heading for rendezvous with the space station on Saturday. T+plus 10 seconds. Houston is now controlling the final flight of Discovery as the shuttle clears the tower at Complex 39. T-minus 10, 9, 8, 7, 6, main engine ignition, 4, 3, 2, 1 and LIFTOFF! Liftoff of space shuttle Discovery, making one last trip to orbit, installing one last module on the International Space Station. T-minus 31 seconds. AUTO SEQUENCE START! The handoff has occurred from the Ground Launch Sequencer to the space shuttle. Discovery's computers now controlling. In the next few seconds, the solid rocket booster hydraulic steering system will be started, the orbiter's body flap and speed brake moved to their launch positions, the firing chain armed. Main engine ignition begins at T-minus 6.6 seconds. T-minus 1 minute. Computers are verifying that the main engines are ready for ignition. Sound suppression water system is armed. The system will activate at T-minus 16 seconds to suppress the sound produced at launch. And the residual hydrogen burn ignitors are armed. They will be fired at T-minus 10 seconds to burn off hydrogen gas from beneath the main engine nozzles. Shortly, the external tank strut heaters will be turned off; Discovery will transition to internal power; the liquid oxygen and liquid hydrogen outboard fill and drain valves will be closed; the payload bay vent doors will be positioned for the launch; and the gaseous oxygen vent arm will be verified fully retracted. Now 90 seconds from the final launch of Discovery. T-minus 2 minutes. The astronauts are being instructed to close and lock the visors on their launch and entry helmets. At T-minus 1 minute, 57 seconds the replenishment to the flight load of liquid hydrogen in the external tank will be terminated and tank pressurization will begin. T-minus 2 minutes, 30 seconds. The external tank liquid oxygen vent valve has been closed and pressurization of the LOX tank has started. Discovery's power-producing fuel cells are transferring to internal reactants. The units will begin providing all electricity for the mission beginning at T-50 seconds. And pilot Eric Boe has been asked to clear the caution and warning memory system aboard Discovery. He will verify no unexpected errors in the system. In the next few seconds, the gaseous oxygen vent hood will be removed from atop the external tank. Verification that the swing arm is fully retracted will be made by the Ground Launch Sequencer at the T-minus 37 second mark. T-minus 3 minutes. Orbiter steering check is now complete and the main engine nozzles are in their start positions. T-minus 3 minutes, 30 seconds. The main engine nozzles now being moved through a computer controlled test pattern to demonstrate their readiness to support guidance control during launch. T-minus 4 minutes. Activation of the APUs is complete. The three units are up and running normally. And the final helium purge sequence is underway in the main propulsion system. This procedure readies fuel system valves for engine start. In the next few seconds, the aerosurfaces of Discovery will be run through a pre-planned mobility test to ensure readiness for launch. This is also a dress rehearsal for flight of the orbiter's hydraulic systems. T-minus 5 minutes. The "go" has been given for Auxiliary Power Unit start. Pilot Eric Boe is now flipping three switches in Discovery's cockpit to start each of the three APU's. The units, located in the aft compartment of Discovery, provide the pressure needed to power the hydraulic systems of the shuttle. The units will be used during the launch and landing phases of the mission for such events as moving the orbiter's aerosurfaces, gimbaling the main engine nozzles and deploying the landing gear. Over the course of the next minute, the orbiter's heaters will be configured for launch by commander Steve Lindsey, the fuel valve heaters on the main engines will be turned off in preparation for engine ignition at T-6.6 seconds and the external tank and solid rocket booster safe and arm devices will be armed. Standing by to pick up. Range is GO for launch. T-minus 5 minutes and holding. Only 60 seconds of hold time left. T-minus 5 minutes and holding. Only 90 seconds of hold time left. T-minus 5 minutes and holding. Liftoff must occur by 4:53:27pm or scrub. T-minus 5 minutes and holding. The countdown has stopped for the Range problem. The available launch window extends only three more minutes. T-minus 5 minutes, 30 seconds. APU pre-start is complete and the units are ready for activation. The orbiters flight data recorders have gone into the record mode to collect measurements of shuttle systems performance during flight. T-minus 6 minutes. Pilot Eric Boe has been asked by the orbiter test conductor to pre-start the orbiter Auxiliary Power Units. This procedure readies the three APU's for their activation after the countdown passes T-minus 5 minutes. T-minus 6 minutes, 30 seconds. No change on the Range problem. T-minus 7 minutes, 30 seconds. The Ground Launch Sequencer has started pulling the orbiter access arm away from the crew hatch on the port side of the vehicle. The arm was the passage way for the astronauts to board Discovery a few hours ago. The arm can be re-extended very quickly should the need arise later in the countdown. T-minus 8 minutes and counting. Pilot Eric Boe has flipped the switches in the cockpit of Discovery to directly connect the three onboard fuel cells with the essential power buses. Also, the stored program commands have been issued to the orbiter for antenna alignment and management during launch. T-minus 9 minutes and counting! The Ground Launch Sequencer has been initiated. The computer program is located in a console in the Firing Room of the Complex 39 Launch Control Center. The GLS is the master of events through liftoff. During the last 9 minutes of the countdown, the computer will monitor as many as a thousand different systems and measurements to ensure that they do not fall out of any pre-determine red-line limits. At T-minus 31 seconds, the GLS will hand off to the onboard computers of Discovery to complete their own automatic sequence of events through the final half minute of the countdown. Now 10 minutes from blastoff, if the Range can resolve the computer glitch. The countdown will resume from the T-minus 9 minute mark at 4:41:27 p.m. EDT. NASA launch director Mike Leinbach has conducted his poll and given approval to resume the countdown to proceed down to T-minus 5 minutes and hold there if Range isn't "go" by then. The poll by NASA test director Steve Payne confirms there only problem is this Range Safety computer problem. Powering space shuttle Discovery throughout its eight-and-a-half minute climb to orbit will be the three main engines built by Pratt & Whitney Rocketdyne. The cryogenic powerplants are fed with liquid hydrogen and liquid oxygen stored in the external fuel tank. In the engine No. 1 position is the Block 2-2044 engine now making its 13th launch. STS-89 was its debut flight in 1998 on a mission to the Russian space station Mir. Making its 11th launch is the Block 2-2048 in the engine No. 2 position. This powerplant started flying on STS-95 in 1998 when John Glenn made his historic return to space. And Block 2-2058 is engine No. 3 on Discovery. It has five previous flights, starting with STS-116 that went to the International Space Station in 2006. .
Mike Leinbach just radioed commander Steve Lindsey and said the team is ready to take things down to the wire if necessary to get the Range problem resolved. Launch director Mike Leinbach says the option is available to resume the countdown at T-minus 9 minutes and continue down to T-minus 5 minutes even if the problem isn't resolved. That would give the Range a few more minutes to resolve the problem. But NASA doesn't like going beyond T-minus 5 minutes until all systems are "go." Today's launch window closes at 4:53:27 p.m. EST. So Discovery must lift off by then or else wait until another day. The Air Force-controlled Range is working the problem in hopes of getting the computer system back online for launch at 4:50 p.m. EST. The Eastern Range is "no go" at current time because of a problem with the central command computer. We're now 25 minutes from Discovery's launch on an eight-and-a-half minute trek to space. At main engine cutoff, Discovery will be flying on a suborbital trajectory with a high point of 136 statute miles and low point of 36 statute miles, inclined 51.6 degrees to the equator. A half-hour later, the twin orbital maneuvering engines will be fired to place the shuttle into a 141 by 98 statute mile orbit. At launch, the space station will be flying 220 miles over the southern Pacific Ocean. Liftoff at 4:50 p.m. EST is timed to place Discovery on course to dock with the station two days from now. Weather is "go" across the board. The reusable solid rocket boosters, built by ATK, provide the primary thrust to propel the space shuttle away from Earth during the initial two minutes of flight. The 11 sections on each booster flying on Discovery are a mixture of refurbished and brand new hardware. The upper cylinders on the both boosters, for example, flew on the very first shuttle mission in 1981. And a cylinder on the right-hand booster is flying for the first time. In all, the twin boosters flying on Discovery have reused segments and pieces that trace back to 54 previous shuttle launches and 18 ground test-firings. Detailed history information about Discovery's two boosters can be seen in this PDF download here. The boosters will parachute into the Atlantic Ocean where a pair of retrieval ships are standing by to recover the rockets and tow them back to shore. The closeout crew is driving away from the pad. The work to seal the shuttle's crew compartment hatch for flight is complete. And the closeout team that assisted the astronauts into Discovery today has stowed equipment in the White Room before leaving the launch pad now. T-minus 9 minutes and holding. Countdown clocks have gone into the planned 45-minute, 27-second built-in hold. Launch is targeted for 4:50:27 p.m. EST. The closeout crew has painted some black coating to color over the chipped tile. The Main Propulsion System helium system has been reconfigured by pilot Eric Boe. Soon the gaseous nitrogen purge to the aft skirts of the solid rocket boosters will be started. Now one hour away from liftoff. Mission Control in Houston is loading Discovery's onboard computers with the proper guidance parameters based on the projected launch time. Commander Steve Lindsey has enabled the abort steering instrumentation. And pilot Eric Boe has configured the displays inside Discovery's cockpit for launch. T-minus 20 minutes and counting. The countdown has resumed after a 10-minute hold. Clocks will tick down for the next 11 minutes to T-minus 9 minutes where the final planned hold is scheduled to occur. The hold length will be adjusted to synch up with today's preferred launch time of 4:50:27 p.m. EST. Discovery's onboard computers are now transitioning to the Major Mode-101 program, the primary ascent software. Also, engineers are dumping the Primary Avionics Software System (PASS) onboard computers. The data that is dumped from each of PASS computers is compared to verify that the proper software is loaded aboard for launch. The official launch window has been revised based on the latest radar tracking of the space station's orbit. The period begins at 4:47:25 p.m. and extends to 4:53:27 p.m. EST for Discovery to rendezvous with the station on Flight Day 3. The preferred launch time is 4:50:27 p.m. EST. The closeout crew is measuring the Discovery tile that suffered minor damage when removing some paper coverings. The tile's black coating was chipped, revealing the underlying white material. T-minus 20 minutes and holding. The countdown has paused for a 10-minute built-in hold. Launch is scheduled for 4:50 p.m. EST. During this built-in hold, all computer programs in Firing Room 4 of the Complex 39 Launch Control Center will be verified to ensure that the proper programs are available for the countdown; the landing convoy status will be verified and the landing sites will be checked to support an abort landing during launch today; the Inertial Measurement Unit preflight alignment will be verified completed; and preparations are made to transition the orbiter onboard computers to Major Mode 101 upon coming out of the hold. This configures the computer memory to a terminal countdown configuration. When removing some protective paper off the crew module hatch area, the tape has pulled a bit of the black thermal tile's covering. Commander Steve Lindsey is pressurizing the gaseous nitrogen system for Discovery's Orbital Maneuvering System engines and pilot Eric Boe activated the gaseous nitrogen supply for the orbiter's Auxiliary Power Units' water spray boilers. Mainline activation of the Ground Launch Sequencer has been completed. This is the master computer program that will run the final nine minutes of the countdown. Now 90 minutes from launch. No issues of any significance are being reported in the countdown. The ground pyrotechnic initiator controllers (PICs) are scheduled to be powered up around this time in the countdown. They are used to fire the solid rocket hold-down posts, liquid oxygen and liquid hydrogen tail service mast and external tank vent arm system pyros at liftoff and the space shuttle main engine hydrogen gas burn system prior to engine ignition. The shuttle's two Master Events Controllers are being tested. They relay the commands from the shuttle's computers to ignite, and then separate the boosters and external tank during launch. Discovery's hatch has been closed and locked. The orbiter closeout team at the launch pad is shutting Discovery's crew module hatch for flight. The pad crew is ready to close up Discovery's hatch. The astronauts are completing a series of radio communication checks with ground controllers. The final Discovery astronaut has boarded the shuttle today. Al Drew just entered the hatch to sit on the flight deck's aft-center seat as mission specialist No. 1 and the ascent flight engineer. Drew was an Air Force helicopter pilot and flew combat missions in Panama, the Persian Gulf and Northern Iraq during his military career before coming to NASA in 2000. This flight calls for the Washington, D.C., native to perform a pair of spacewalks outside the space station with fellow astronaut Steve Bowen. Drew's previous spaceflight came in 2007 aboard shuttle Endeavour's STS-118 assembly and resupply trip to the space station. Read his NASA biography here and Spaceflight Now+Plus subscribers can watch an extended pre-launch interview. Nicole Stott, another previous resident of the International Space Station, serves as Discovery's mission specialist No. 4 for her second spaceflight. She just entered the orbiter's hatch to take the aft-right seat on the flight deck. Born in Albany, New York, and raised in Clearwater, Florida, she attended Embry-Riddle Aeronautical University before going to work as a structural design engineer at Pratt & Whitney. Stott then became a Kennedy Space Center worker on space shuttles and station hardware on the road to becoming an astronaut. Her station voyage last year started by launching on Discovery's STS-128 mission and returning to Earth some 91 days later on Atlantis' STS-129 flight. Read her NASA biography here and Spaceflight Now+Plus subscribers can watch an extended pre-launch interview. Now passing the T-minus 2 hour mark in the countdown. A pair of 10-minute built-in holds are planned at T-minus 20 minutes and T-minus 9 minutes, leading toward the 4:50 p.m. T-0 time. Mission specialist No. 2 Steve Bowen just crawled through the hatch to take the right-hand seat on the middeck. He was a recent substitute added to the crew to replace the injured Tim Kopra as the mission's lead spacewalker. Kopra was hurt in a bicycle accident and now can't make the flight. Bowen, the only submarine officer to become an astronaut, hails from Massachusetts and has degrees from the Naval Academy and MIT. He visited the space station on the Endeavour mission in late 2008 that saw him conduct three spacewalks and flew on the most recent shuttle flight last May that included two more EVAs to his credit. Read his NASA biography here. Discovery pilot Eric Boe is making his way to the flight deck's front-right seat right now. Boe, who grew up in Atlanta and became an Air Force colonel with combat and flight test credentials, is returning to space for the second time as pilot. He arrived at NASA in 2000 and flew on the Endeavour mission in 2008 that outfitted the space station's interior with equipment needed for doubling the size of its resident crews. Mike Barratt has spent 199 days in space but he's never launched aboard an American spacecraft. A medical doctor born in Washington state, he worked as a NASA flight surgeon before being selected as an astronaut. Then came the opportunity to spend a half-year living aboard the International Space Station in 2009, launching aboard a Russian Soyuz rocket and returning to Earth in the tiny capsule. For his one-and-only shuttle flight, Barratt will be mission specialist No. 3 and ride uphill in the middeck's left-hand seat. Commander Steve Lindsey is the first astronaut to board the shuttle today, taking the forward-left seat on the flight deck. The 50-year-old retired Air Force colonel with over 6,500 flight hours in more than 50 different aircraft has flown on four space shuttle missions and served as NASA's chief astronaut. Lindsey flew as pilot on the STS-87 science flight of Columbia in 1997 and the STS-95 mission in 1998 aboard Discovery that included John Glenn's return to space. His first command came in 2001 as Atlantis' skipper on STS-104 that launched the Quest airlock module to the space station. He then led Discovery's STS-121 test flight in 2006. The final inspection team has left the pad after the pre-launch checks. No problems were reported during the team's work today. The astronauts are taking a few moments to gaze up at their spacecraft from the pad surface before ascending the tower. Discovery's crew has arrived at launch pad 39A. The AstroVan came to a stop on the pad surface near the Fixed Service Structure tower elevator that will take the six-person crew to the 195-foot level to begin boarding the shuttle. The AstroVan is passing the 52-story Vehicle Assembly Building where Discovery was attached to its external tank and solid rocket boosters and the adjacent Launch Control Center. The Press Site is located across the street, and reporters went outside to watch the passing convoy. This is a launch day tradition to say farewell and good luck to the astronaut crews. HERE COMES THE CREW. Space shuttle Discovery's six veteran astronauts have departed Kennedy Space Center's crew quarters building for today's launch into Earth orbit. Commander Steve Lindsey, pilot Eric Boe and mission specialists Al Drew, Steve Bowen, Mike Barratt and Nicole Stott will ride the AstroVan to pad 39A on the edge of the Atlantic Ocean where they will climb aboard the orbiter this afternoon. The astronauts are leaving the suitup room and heading down the hallway to board the elevator that will take them down to the AstroVan parked outside the Operations & Checkout Building in KSC's Industrial Area. T-minus 3 hours and counting. The countdown clocks are ticking again after the planned two-and-a-half hour built-in hold. Clocks will proceed to T-minus 20 minutes when the next hold is scheduled. A final hold occurs at the T-minus 9 minute mark to synch up with the 4:50:27 p.m. EST launch time. The final inspection team isn't reporting any worries or concerns thus far in their ongoing observations of the shuttle vehicle. Space shuttle Discovery's astronauts -- all experienced veterans -- are donning their day-glow orange launch and entry partial pressure spacesuits. After final adjustments and pressure checks, the astronauts will depart the suitup room and take the elevator down to the ground level of the Operations and Checkout Building to board the AstroVan for the trip to launch pad 39A at 1:00 p.m. The latest check on the weather shows fine conditions here at the Cape for shuttle Discovery's departure this afternoon. And overseas at the emergency landing sites, meteorologists report the weather is acceptable at the Zaragoza and Moron runways in Spain. Discovery astronaut Nicole Stott just tweeted: "Off to put on big orange suit. Thanks for all your kind words for me & the whole STS133 crew. Will try to tweet from space. Go Discovery!" Our launch webcast anchored by Miles O'Brien, with journalist David Waters and for space station commander Leroy Chiao is streaming live on this page. The countdown remains on schedule and free of any problems for space shuttle Discovery. The weather is looking perfect. Recent activities in the countdown have included calibrations of the orbiter's inertial measurement units, powering up Discovery's navigation systems, the pre-flight alignment of ground station antennas with the launch pad and communications checks with the Eastern Range. The Final Inspection Team is out at the launch pad to scan the vehicle for any ice or debris concerns following fueling operations. The team is responsible for checking the shuttle and launch pad one last time prior to liftoff. The team is comprised of engineers and safety officials from NASA, United Space Alliance and tank-builder Lockheed Martin. At the conclusion of their two-hour tour-of-duty, the team will have walked up and down the entire fixed service structure and mobile launcher platform. The team is on the lookout for any abnormal ice or frost build-up on the vehicle and integrity of the external tank foam insulation. The team uses a portable infrared scanner that gathers temperature measurements on the surface area of the shuttle and can spot leaks. The scanner will be used to obtain temperature data on the external tank, solid rocket boosters, space shuttle orbiter, main engines and launch pad structures. The scanner can also spot leaks of the cryogenic propellants, and due to its ability to detect distinct temperature differences, can spot any dangerous hydrogen fuel that is burning. The team wears the highly visible day-glow orange coveralls that are anti-static and flame resistant. Each member also has a self-contained emergency breathing unit that holds about 10 minutes of air. Discovery astronaut Nicole Stott just tweeted: "ATV docking complete! ISS just got bigger. Congrats to ESA and all the station partners around the world!" Hooks and latches have engaged in space station docking port to firmly secure ATV cargo ship. That's very good news for clearing shuttle Discovery to launch today. Initial inspections haven't indicated any problems with the insulation foam on the repaired midsection of shuttle Discovery's tank. ATV has arrived at the space station! Europe's massive cargo freighter docked to outpost at 10:59 a.m. EST. Follow our separate Mission Status Center for live updates on the rendezvous. With the hazardous tanking operation now completed, the Orbiter Closeout Crew and Final Inspection Team have been dispatched to the pad to perform their jobs. The closeout crew will ready Discovery's crew module for the astronauts' ingress in a couple of hours; and the inspection team will give the entire vehicle a check for any ice formation following fueling. T-minus 3 hours and holding. Clocks have entered a planned two-hour, 30-minute built-in hold. Additional pauses are scheduled at the T-minus 20 and T-minus 9 minute marks, setting up the countdown for launch at 4:50 p.m. EST. TANK FULL. Liquid oxygen has entered stable replenishment mode, officially completing today's three-hour external tank filling process. For those of you keeping score at home, fueling began at 7:25 a.m. and concluded at 10:19 a.m. EST. Our stream is showing the European Space Agency's ATV 2 cargo freighter docking to the International Space Station right now. Today's space shuttle countdown is relying on good rendezvous by the ATV. The linkup is expected at 11 a.m. EST. Liquid hydrogen loading was completed at 9:58 a.m. EST. After reaching the 98 percent level, the topping sequence was performed. And now the stable replenishment mode has been activated to keep the tank full through the rest of the countdown, replacing the supercold propellant that naturally boils away. "Right now, it feels good. The weather looks great," shuttle launch director Mike Leinbach says. "The vehicle, you know, it's a machine. So you never know till the final seconds on the clock if all pieces of the machine are going to behave. But right now it feels good. I've been in other countdowns when you just kinda get the feeling like it just might not be just right. But so far, so good today." "We are feeling very, very confident now that we have a good seal on the hydrogen vent arm, and so that should not give us any more problems for the rest of the day. It performed just as it did in the tanking test (Dec. 17), so we should be good to go, from that perspective," shuttle launch director Mike Leinbach just said. Liquid hydrogen loading has entered the topping mode. No leakage is being seen around the ground umbilical carrier plate on the backside of shuttle Discovery's external tank as the liquid hydrogen system is topped off. There are two tanks inside the shuttle's external fuel tank. The liquid oxygen tank occupies the top third of the bullet-shaped tank. It will be filled with 143,000 gallons of liquid oxygen chilled to minus 298 degrees Fahrenheit. The liquid hydrogen tank is contained in the bottom two-thirds of the external tank. It holds 385,000 gallons of liquid hydrogen chilled to minus 423 degrees Fahrenheit. All is going well 90 minutes into the fueling operations for space shuttle Discovery. The cryogenics flow from storage spheres at the pad, through feed lines to the mobile launcher platform, into Discovery's aft compartment and finally into the external fuel tank. After more than a week of testing and orbit-changing rocket burns since launching from the coast of South America, the Johannes Kepler automated cargo freighter is closing in on the International Space Station for docking today. Follow our separate Mission Status Center for live updates on the rendezvous. Both liquid oxygen and liquid hydrogen loading have switched to the "fast-fill" mode as fueling of space shuttle Discovery proceeds via remote control at launch pad 39A. The fueling sequence started with the chilldown of the liquid oxygen system at 7:25 a.m. EST. The transfer lines on the liquid oxygen side will be chilled down, then the main propulsion system conditioning is completed. The liquid hydrogen loading has transitioned from the chilldown thermal conditioning process to the "slow-fill" mode. This fills a small fraction of the tank, then the loading switches to "fast-fill" mode. The propellant started flowing into the tank at 7:36 a.m. EST. FUELING UNDERWAY. Today's filling of space shuttle Discovery's external tank has started. It will take three hours to get the half-million gallons of fuel aboard the shuttle for launch. T-minus 6 hours and counting. The countdown has resumed ticking after a two-hour hold. The next scheduled built-in hold will occur at T-minus 3 hours. Fueling should be getting underway shortly. No problems are being worked in the countdown this morning. The launch team conducts a safety check on the pyrotechnic circuits to ensure they are in a good configuration before fueling starts. That's the final step before the tanking preps can commence. The testing is then re-performed after the shuttle gets into cryogenic conditions and before the ice inspection team and orbiter closeout crew head to the pad. The Mission Management Team met for the pre-fueling meeting and granted approval to load a half-million gallons of supercold rocket fuel into Discovery's external tank for launch. The weather is acceptable out at launch pad 39A for fueling Discovery this morning. The conditions include some scattered clouds, good visibility, northeasterly winds of 8 knots and a temperature of 60 degrees F.
And the latest forecast for today's 4:50 p.m. EST launch has been upgraded to a 90 percent chance of acceptable weather for Discovery to fly as scheduled. The outlook at launch time is expected to include some scattered clouds at 3,000 and 25,000 feet, good visibility, southeasterly winds of 14 knots gusting to 20 knots and a temperature of 73 degrees. The odds of good weather for Friday and Saturday are 70 percent and 60 percent, respectively. T-minus 6 hours and holding. The countdown has gone into the scheduled two-hour built-in hold prior to the start of fueling. The Mission Management Team is scheduled to convene its critical pre-fueling meeting around 6:45 a.m. EST. Spaceflight Now captured these photos of Discovery during tower rollback Wednesday night. On the evening before her last launch, the space shuttle Discovery has been unveiled from the cocoon-like service gantry at Kennedy Space Center's pad 39A for Thursday's liftoff. "She's been an amazing machine. She's done everything we've asked of her," Leinbach says. "She flies really, really well -- very, very few problems on orbit. I expect that to be the same this time. We'll turn it over to Steve Lindsey and the crew at liftoff, and the flight directors out of Houston, and they'll perform the mission. She'll complete (flight) number 39 and then she'll be retired," says shuttle launch director Mike Leinbach. Technicians will spend this evening getting ground equipment configured and secured in preparation for tomorrow's fueling with supercold rocket propellant. Inside Discovery's cockpit, meanwhile, support personnel will verify all of the switches are in the correct positions for ascent. Clocks will resume counting at 12:25 a.m. EST after the half-day hold at T-minus 11 hours. The orbiter's fuel cells are activated about an hour later, and the hazard area around the pad gets cleared of all workers around 2:30 a.m. The next planned hold is T-minus 6 hours beginning at 5:25 a.m. EST. During this two-hour pause of the clocks, the Mission Management Team convenes its pre-fueling meeting around 6:45 a.m. to review the status of work, the readiness of shuttle systems and the latest weather forecast. If all goes according to plan, loading of the external tank with propellant will start at 7:25 a.m. EST. The process should take three hours to complete. Join us here in the Mission Status Center for live play-by-play updates throughout the day. And don't miss our launch webcast anchored by Miles O'Brien that begins at 12 noon EST (1700 GMT). Miles will be joined by former space station commander Leroy Chiao, journalist David Waters and several special guests. Liftoff time is 4:50 p.m. EST (2150 GMT) as Discovery sets sail on her final space voyage. "Discovery is a great ship. This is her 39th mission (and) would have quite a few left in her had the program been extended, but it wasn't. And so it's kinda bittersweet that we get the last flight out of her, but she's going to perform perfectly fine on orbit and bring the crew home safely," Leinbach says. Asked about the emotions of the launch, Leinbach said "the last flight of all three vehicles is going to be emotional for all of us." "I think the emotion is really going to hit on the runway after the mission is complete. Landing day's going to be tough," he said. "Landing day of Discovery, and then Endeavour and especially Atlantis, the last mission, you'll see a lot of people out on the runway who will probably choke up some. Because it's the end of a 30-year program that not only have we worked in and made our livelihoods in, but we've grown to love and appreciate and feel like we're doing something special for the country and, really, the world. And it's coming to an end, and that's tough. "But we're going to do it right, we're going to approach each of these three flights the way we approached all the other ones, we'll pull them off and be able to look back and be very, very proud of what we've accomplished in the shuttle program." The gantry has arrived in its parking spot for launch. The structure is nearing its launch position. After initially moving at a glacial pace, the speed has picked up and the massive gantry is clear of the shuttle now as it continues to back away. Rollback of the rotating service structure to reveal shuttle Discovery has started at launch pad 39A. You can watch the tower retraction in our live streaming video. The observers are on station, inspections are complete and the pathway that the rotating structure will follow has been cleared of personnel. The move is scheduled to begin shortly. The walkdown inspections at the pad prior to gantry rollback have been completed with no descrepencies reported. Rollback of the rotating service structure to reveal shuttle Discovery is coming up later this evening. The plan calls for final walkdown inspections of the pad starting at 6:15 p.m., observers at their duty posts around 7:15 p.m. and gantry retraction starting at 8 p.m. EST. Discovery's six astronauts are spending today visiting with their families and touring the shuttle at the pad. They also received briefings on orbiter preparations, the payload status and the weather forecast from the ascent team of flight controllers in Houston. They will go to sleep at 11 p.m. EST and will be awakened for launch day at 7 a.m. tomorrow. They'll have breakfast at 7:30 a.m. and then undergo final medical exams at 8 a.m. Suit up begins about 12:30 p.m. and departure from crew quarters is scheduled for 1:00 p.m. in preparation for blastoff at 4:50 p.m. EST. The official launch window for Thursday's shot at getting space shuttle Discovery into orbit for docking with the International Space Station extends for 10 minutes. Based on the latest radar tracking of the space station's orbit and subsequent revision from Mission Control, the single-pane window leading to rendezvous on Flight Day 3 will open at 4:45:27 and last until 4:55:27 p.m. EST. The targeted liftoff time occurs in the middle of the period at 4:50:27 p.m. EST. That's the moment when Earth's rotation carries the launch pad into the plane of the station's orbit. We have updated our countdown timeline and launch events pages with this latest tweak to the liftoff time. If liftoff slips to Friday for some reason, the backup launch opportunity offers a window of 4:19:44 to 4:29:45 p.m. EST. The preferred launch time would be 4:24:44 p.m. EST. With good weather expected, NASA managers Wednesday cleared the shuttle Discovery for launch Thursday on a long-delayed space station resupply mission, the orbiter's 39th and final flight. The Mission Management Team gathered this morning for its pre-launch meeting and verified all systems remain "go" for shuttle Discovery's blastoff Thursday at 4:50 p.m. EST. "Today we held our launch-minus-1-day Mission Management Team meeting where we got together just to discuss our current status and our readiness. Everything is on track going beautifully with the countdown and we're more than ready for tomorrow's launch," says pre-launch MMT chairman Mike Moses. "Everything is going extremely well in the launch countdown for Discovery's last mission. I would like to commend the processing teams who worked on Discovery and all other flight elements and ground systems because what we're seeing is as we power them up in launch countdown, no problems at all," shuttle launch director Mike Leinbach added. Final tests of the avionics, pneumatics and controllers for the three main engines were completed overnight. Countdown clocks then entered the lengthy T-minus 11 hour planned hold period at 11 a.m. That built-in hold should last 13 hours and 25 minutes. Today's chores at launch pad 39A are focused on functional checks of the orbiter's star trackers, activating the inertial measurement units, thoroughly testing the communications network, loading the last items into the crew module, filling of the launch pad's sound suppression system water tank and installing film in pad cameras. The giant gantry-like rotating service structure is scheduled for retraction from around Discovery at 8 p.m. Fueling of the shuttle's giant external tank begins at 7:25 a.m. tomorrow. "We're not tracking any issues and Discovery looks like she'll fly this time," Leinbach said. The weather forecast for Thursday's launch remains favorable with an 80 percent chance of conditions within allowable limits. The odds drop to 70 percent on Friday and down to 60 percent on Saturday. The outlook from Air Force meteorologists: "There is no significant change to the launch day forecast again. Today, an area of high pressure will move into the Northeast U.S. As this high moves off the coast tomorrow, winds will shift to the southeast over KSC. The expected on-shore flow tomorrow causes a slight concern for morning coastal showers that will likely dissipate in the afternoon. "By launch time, winds will be gusting to 20 knots from the southeast, but within constraints. Our primary concerns for launch are a low cloud ceiling and isolated showers within 20 nautical miles of the Shuttle Landing Facility (SLF)." The launch time conditions are expected to include some scattered clouds at 3,000 and 25,000 feet, good visibility, southeasterly winds at 14 knots gusting to 20 knots and a temperature of 73 degrees. "The concern for a low cloud ceiling and showers increases the following two days as a cold front moves into the area Friday and lingers through Saturday. In addition, as the front approaches Florida, winds will shift to the southwest on Friday, causing a SLF crosswind concern," forecasters say. The cryogenic reactants for the space shuttle's electricity-generating fuel cells were successfully loaded aboard Discovery during a multi-hour operation at pad 39A today. Work is underway tonight to adjust the tank levels, actually removing some liquid oxygen off the vehicle, to optimize Discovery's launch weight. Space shuttle main engine checkouts will be performed early Wednesday while other pad technicians continue work to button up the orbiter and ground support equipment for launch. Liftoff remains targeted for Thursday at 4:50 p.m. EST (2150 GMT). Our live launch webcast hosted by Miles O'Brien, David Waters and former astronaut Leroy Chiao begins at 12 noon EST (1700 GMT) Thursday from the Kennedy Space Center. A revised NASA Television schedule for mission has been released with updated briefing times. The shuttle Discovery's countdown is ticking smoothly toward launch Thursday on a space station re-supply mission. There are no technical problems of any significance at pad 39A and forecasters are continuing to predict an 80 percent chance of good weather. The NASA Television schedule for shuttle Discovery's mission has been published. Liquid hydrogen and liquid oxygen for space shuttle Discovery's electricity-generating fuel cells will be loaded into storage spheres beneath payload bay beginning around 12:30 p.m. EST today as standard work continues at pad 39A for Thursday's launch. The cryogenic reactants are combined by the three onboard fuel cells to produce power and a byproduct of drinking water during the shuttle's mission. Technicians flow the cryogenics into small tanks aboard the orbiter during a multi-hour operation, then plan to offload about 120 pounds of liquid oxygen to reach the desired mass for launch. Later, they will demate the pad umbilical system used in the loading process and stow that equipment. "Our launch countdown is proceeding smoothly and is on schedule. We're working only one minor issue. We have a slight internal leakage on a reaction control system regulator. However, we've seen this issue before. It is well within our acceptable limits and we're going to accept it for flight. It should be waived here shortly," said Steve Payne, the NASA test director. "Discovery is poised to lift off Thursday afternoon bound for the International Space Station to do what she does best." Earlier this morning, tests of the shuttle's pyrotechnic initiator controllers and range safety systems were completed while the pad was cleared of personnel. The countdown is in the midst of a planned four-hour hold at the T-minus 27 hour mark. The pause began at 7 a.m. and lasts through 11 a.m. EST. Once they countdown resumes, the clocks will continue until the next hold point at T-minus 19 hours starting at 7 p.m. EST, which is when the ground team wrap up the fuel cell servicing work. Discovery's all-veteran crew are scheduled to undergo medical exams today, commander Steve Lindsey and pilot Eric Boe will get some landing practice using Shuttle Training Aircraft and T-38 jets at the Kennedy Space Center runway, and a briefing on the orbiter ingress plan for launch day is planned this afternoon. "Over the last few months, the team has been very busy affecting repairs to the external tank and making it stronger than ever. We've also resolved our problem with our hydrogen vent system leak, and are now ready to fly again," Payne said. The weather outlook remains 80 percent favorable for Thursday's launch. "There is no significant change to the forecast today," meteorologists report. "An upper level ridge is still located over the Gulf of Mexico and Florida keeping Kennedy Space Center's weather mild and dry. Complex 39A temperatures will continue to be between 60F and 73F for the next few days. Winds today will be from the southwest gusting to 17 knots, and will shift from the north tomorrow, decreasing as a dry, weak front passes through. "By launch day, the upper level ridge will still be in place, and another area of high pressure will be moving off eastern coast of the U.S. Southeast low-level winds will prevail over KSC causing a chance for morning coastal showers due to offshore convergent bands. These will likely dissipate by the afternoon. "By launch time, winds will be gusting to 20 knots from the southeast, but within constraints. Our primary concerns for launch are a low cloud ceiling and isolated showers within 20 nautical miles of the Shuttle Landing Facility (SLF). "The concern for a low cloud ceiling and showers increases the following two days as a cold front moves into the area Friday and lingers through Saturday." Three-and-a-half months after the shuttle Discovery was grounded by potentially dangerous cracks in its external tank, the orbiter is finally back on track for launch Thursday to deliver critical spare parts, supplies and a final U.S. module to the International Space Station. This is our five-piece, 5,400-word mission preview. Engineers restarted the repaired shuttle Discovery's countdown Monday, setting the stage for launch Thursday on a space station resupply mission that's been grounded since November because of cracks in the ship's external tank. COUNT BEGINS. Countdown clocks at the Kennedy Space Center just began ticking toward Thursday's scheduled launch of the shuttle Discovery on the veteran ship's final trek to space. The official countdown sequence started at 3 p.m. EST inside Firing Room 4 of the Complex 39 Launch Control Center. Launch team members had gathered for the "call-to-stations" at 2:30 p.m. The count commenced from the T-minus 43 hour mark. But a series of pre-planned holds are timed throughout the next few days, leading to the targeted liftoff time of 4:50 p.m. EST. "Discovery has been a really remarkable vehicle for us and for the program. She still has a few more miles to go before she sleeps though. She's taken us on many amazing journeys throughout the years and we expect this flight to be no different than any of those," said Jeff Spaulding, the NASA test director. This is the second countdown for Discovery's final launch, after technical troubles scrubbed the mission in early November and kept the vehicle grounded until now. "It's been an interesting and exciting and challenging few months for us," Spaulding said. "This will be the second longest vertical flow for the (shuttle). Vertical flow starts when we roll out of the orbiter processing facility. The longest one for us was STS-35, which was 183 days, and this one will be 170 if we make our launch date on Thursday." The weather forecast looks promising for Thursday afternoon's launch opportunity and there are no hardware worries being worked as the countdown starts. "Last night, we did complete our flight pressurization of our on-orbit control system tanks as well as our main propulsion system tanks, and that operation very well just as planned," Spaulding said. Activities planned during the early portion of the countdown for shuttle workers include buttoning up launch pad equipment and removing platforms inside the orbiter's crew module, reviewing flight software stored in Discovery's mass memory units, loading backup software into the general purpose computers and testing navigation systems. "The people that have worked on this team have loved this vehicle for many, many years. So it is a bittersweet thing for them to say goodbye to her on her last mission. But I also think they've put in the pride and dedication that we've seen throughout the years and the last few months have been no different than that. Everyone is proud in what they've done and happy to see her go off on this last mission," Spaulding said. The weather outlook issued moments ago by the launch meteorology team gives an 80 percent chance for Discovery to fly on Thursday as planned. The small chance of weather prohibiting launch involves the possibility of low clouds and rainshowers in the area. The specifics call for scattered clouds at 3,000 feet and 25,000 feet, good visibility, southeasterly winds of 14 peaking to 20 knots and a temperature of 73 degrees. "An upper level ridge located over the Gulf of Mexico and Florida as well as a surface high pressure area off the Florida East Coast are proving pleasant weather conditions for Kennedy Space Center. For the next several mornings, high temperatures at complex 39A will continue to be in the low 70s while low temperatures will be near 60F. "By launch time, winds will be gusting to 20 knots from the southeast, but within constraints. Our primary concerns for launch are a low cloud ceiling and isolated showers within 20 nautical of the Shuttle Landing Facility (SLF). If Discovery's launch slips to Friday for some reason, the odds of acceptable weather dips to 70 percent and then falls to 60 percent on Saturday. A veteran astronaut crew with over a year of collective spaceflight experience has arrived at the Florida spaceport to begin final preps before taking the shuttle Discovery on its final voyage to orbit Thursday. The shuttle Discovery's five-man one-woman crew flew to the Kennedy Space Center Sunday to prepare for another launch try Thursday, more than three-and-a-half months after the flight was put on hold because of cracks in the ship's external tank. Six astronauts traveled from their home base in Houston to the Kennedy Space Center launch site in sleek T-38 jets this afternoon, trained and ready to take shuttle Discovery for its final spaceflight. Commander Steve Lindsey, pilot Eric Boe and mission specialists Al Drew, Steve Bowen, Nicole Stott and Mike Barratt arrived at the Florida spaceport to begin counting down to Thursday's blastoff. "It's great to be back at the Cape," said Lindsey. "We're back here for another attempt at this. We're pretty confident about this one." The crew will head to sleep at 11 p.m. EST, then be awakened at 7 a.m. Monday for Lindsey and Boe to fly landing approaches into KSC's runway using Shuttle Training Aircraft. The entire crew will spend time later in the day reviewing the flight data files and checking their launch and entry spacesuits. Discovery's three-day launch countdown sequence begins Monday at 3 p.m. EST. All activities remain on schedule for Thursday's 4:50 p.m. EST launch time. Out at pad 39A, the orbiter's aft engine compartment has been sealed for flight and pressurization of the shuttle's propulsion systems is getting underway this afternoon. "I'd like to thank the team, the shuttle team in particular, all the folks here and working at all the centers across the country. The external tank problem we have been working the past several months is probably one of the most difficult technical challenges we've faced in recent years. But the team did a great job coming together, figuring out a very difficult engineering problem, coming up with a solution that I think gives us a really good tank to go launch with this week," Lindsey said. Welcome to the spaceport! All six Discovery astronauts have arrived for launch as the T-38 with Nicole Stott rolls to a stop. Mission specialist Steve Bowen is here in another T-38. On hand to greet the arriving astronauts are NASA Administrator Charlie Bolden, KSC Director Bob Cabana and Mike Leinbach, the shuttle launch director. Pilot Eric Boe and mission specialist Mike Barratt have parked their aircraft. Commander Steve Lindsey and mission specialist Al Drew have pulled to a stop in their T-38. The jets are beginning to arrive here at the Kennedy Space Center's Shuttle Landing Facility, which is the same three-mile-long concrete field where Discovery will touch down to conclude the upcoming mission. The first of four T-38s jets is cleared for touchdown. The T-38s are headed for a flyby of shuttle Discovery at launch pad 39A before landing. Commander Steve Lindsey has made voice contact with the KSC tower. This lead aircraft is about 15 minutes away from the spaceport and will targeting Runway 15 for landing. The four planes are heading across the Gulf now. Arrival at Kennedy Space Center remains around 3:45 p.m. EST. Flight tracking shows the astronauts' wave of aircraft flying over the southern coast of Louisiana for their trek to Florida. The shuttle Discovery astronauts are en route from Ellington Field near the Johnson Space Center in Houston on the trip over to the Kennedy Space Center in Florida. Their arrival is expected a little after 3:30 p.m. EST today. After reaching the spaceport, the crew will pose for photos and make a brief statement to the gathered news media. Space shuttle Discovery is powered down today as the team enjoys a day off before getting into the home stretch of pre-launch preparations. "We will come in Sunday afternoon and pressurize the COPVs, the high-pressure gas bottles on the ship. That's a hazardous task that we do late in the pad flow so we expose a minimum amount of people to that hazard. That should go fine Sunday afternoon, Sunday evening," said Mike Leinbach, the shuttle launch director. Discovery's six astronauts will arrive at Kennedy Space Center on Sunday afternoon, too. They are expected around 3:45 p.m. EST in an event that will be shown live on NASA TV and streamed on this page. A preview of the countdown and the early weather outlook for launch will be given during a Monday morning news conference at 10 a.m. EST. The three-day countdown sequence remains set to begin ticking on Monday at 3 p.m. EST. "Everything is going really, really well. I'm looking forward to the countdown starting Monday and a liftoff next Thursday," Leinbach says. NASA managers Friday cleared the shuttle Discovery for launch next Thursday on a long-delayed space station resupply mission after an exhaustive review of ground processing and unprecedented external tank repairs to fix and prevent potentially dangerous cracks in the ship's external tank like those that derailed a launch try last November. The post-FRR news briefing from the Kennedy Space Center is scheduled for 6 p.m. EST. You can watch right here in our streaming coverage coverage of STS-133. The official target launch time for next Thursday is 4:50:24 p.m. EST. That's when Discovery's launch pad and the International Space Station's orbital plane are properly aligned. The day's overall 10-minute launch window runs from 4:45:24 to 4:55:24 p.m. The space shuttle will be inserted into a 145 by 98 statute mile orbit to begin its pursuit of the space station. Docking is now targeted for next Saturday at 2:19 p.m. EST. Today's Flight Readiness Review has concluded with a unanimous "go" for launch of Discovery next Thursday at 4:50 p.m. EST. Senior managers reviewed the readiness of the space shuttle and International Space Station for the mission to deliver the Permanent Multipurpose Module and another spare parts pallet. A news conference with NASA officials is expected at 6 p.m. EST today and we'll stream it live right here on this page. After today's extensive review of shuttle Discovery's external fuel tank cracks and repairs, the readiness review participants say the tank is "go" for launch. Still a bit more work before the FRR does the official poll to set the launch date. The start time for today's post-meeting press conference is no sooner than 6 p.m. EST (2300 GMT). NASA says the FRR is in a brief break while officials "think about the external tank intertank stringer presentations and discussions." A full update on this morning's move of the HTV cargo ship aboard the International Space Station can be read here. The FRR continues with discussions about the modifications made to the external tank due to the tiny cracks in the ribbed midsection. Updated listing of Discovery's available launch windows. Here is a detailed timeline of Discovery's launch countdown. Shuttle Discovery's launch events timeline for climb to orbit. Latest tweaks to Discovery's launch-to-landing timeline. Meanwhile, the Japanese HTV 2 cargo freighter was relocated from the underside to the topside of the International Space Station's Harmony module this morning. That clears the way for shuttle Discovery's mission and avoids any interference from removing payloads from the shuttle's cargo bay. The external fuel tank discussion about the cracks, the mitigating repairs and root cause behind the problem began before lunch and has resumed this afternoon. The morning session of the Flight Readiness Review also received briefings from the mission operations folks who will run STS-133 from Houston and discussed the status of life-support elements aboard the space station. Participants in the FRR have reviewed the scenario of having Discovery ready to launch to just six hours after the Automated Transfer Vehicle arrives at the space station next Thursday. And the decision has been made that it is acceptable. Also reviewed so far this morning was the switch of astronaut Steve Bowen for the injured Tim Kopra. The Flight Readiness Review is underway today at the Kennedy Space Center as senior officials examine all aspects of mission preparations to ensure space shuttle Discovery, its astronauts and payloads are ready to go fly the STS-133 mission, as well as the International Space Station is ready to receive this latest construction flight. The meeting will culminate with managers setting the formal launch date. The shuttle is targeting blastoff next Thursday at 4:50 p.m. EST. NASA plans to hold a post-FRR news conference this afternoon, perhaps around 5:30 or 6 p.m. EST. The exact start time has not been determined. We'll post updates on this page and dispatch Twitter alerts as further details become available. After making minor repairs to a cracked hydraulic hose bracket inside shuttle Discovery's aft engine compartment, that section of the orbiter has been closed for flight. The external tank's midsection has been buttoned up as well. Final testing of the spacewalking suits aboard the shuttle revealed a problem with one of them, prompting a swapout. But now the suits are stowed and the airlock is configured for launch. Discovery's six astronauts -- commander Steve Lindsey, pilot Eric Boe and mission specialists Al Drew, Steve Bowen Nicole Stott and Mike Barratt -- go into to pre-launch quarantine tonight at the Johnson Space Center. They participated in their final training session to simulate re-entry procedures on Monday and the final ascent runs Wednesday. The commander and pilot also got some landing practice in the Shuttle Training Aircraft at White Sands, New Mexico, on Tuesday. They all fly to Kennedy Space Center on Sunday afternoon to begin the countdown to launch. The European Space Agency's Automated Transfer Vehicle 2 soared into orbit atop the 200th Ariane rocket today, taking aim on the International Space Station for rendezvous and docking next week. The 44,000-pound spacecraft is carrying a massive load of supplies and fuel for the orbiting outpost. The docking is scheduled for about 10:45 a.m. EST next Thursday, which is six hours before space shuttle Discovery's planned launch. The Ariane's launch was delayed 24 hours -- from Tuesday to today -- by errant fuel system readings that halted the countdown with just four minutes left to go. The issue was resolved and today's countdown progressed smoothly. NASA originally said that delays with the Ariane launch would postpone Discovery's liftoff too. But the space agency now says it could be possible to keep the shuttle on schedule, since there's ample time between the ATV 2's docking and Discovery's launch. A final decision will be made this Friday at the shuttle's flight readiness review. The docking time would be about 20 minutes after fueling is completed on the shuttle. So under this scenario, NASA would have to press ahead with the countdown and load the shuttle with a half-million gallons of supercold rocket fuel with the belief that the freighter will connect with the station flawlessly. The space shuttle Discovery's launch countdown begins a week from today and final preps for picking up the clocks are underway at the Kennedy Space Center. Out at launch pad 39A, troubles hooking up the gaseous hydrogen vent arm to the ground umbilical carrier plate on the backside of Discovery's external tank appear to be resolved now. Connections have been made and leak checks were performed successfully last Friday. Since arriving at the pad on February 1, key work has included checks of the main engines, calibrations of the vehicle's guidance units, reloading the hydrazine into the solid rocket booster hydraulic power units and the ordnance installation and connections. The shuttle program's flight readiness review was held Friday and gave approval to continue onward with pre-mission work. The senior-level meeting is planned for this coming Friday to officially affirm the planned February 24 launch date. Discovery's six astronauts will get their launch minus 10-day physical exams today before going into quarantine later this week. They are scheduled to fly from Houston to the Florida spaceport Sunday, arriving around 3:45 p.m. EST. The three-day launch countdown sequence will pick up next Monday at 3 p.m. EST. Loading of the ship's cryogenic fuel cell reactants occurs during the afternoon and evening hours of next Tuesday. Retraction of the rotating service gantry from around Discovery is slated for 8 p.m. EST next Wednesday. Launch day activities include starting the three-hour fueling process to fill the external tank at 7:25 a.m., the astronauts getting suited up at 12:30 p.m. and then departing their quarters for the pad at 1:00 p.m.
Liftoff remains targeted for 4:50 p.m. EST (2150 GMT) in the middle of a 10-minute window to reach the International Space Station's orbit. Space station officials are considering the possibility of staging what might be considered the ultimate photo op during Discovery's mission to deliver critical supplies and a final U.S. module to the International Space Station. Meanwhile, NASA managers and contractors met Friday for a program-level flight readiness review for the upcoming shuttle mission.